Find out what happened on Sunday's action here and watch highlights from the first round on the Red Button and online at 14:05 and 19:40 GMT on Saturday, 2 March and on the iPlayer here. Play video Which is the best celebration? from BBC SportWhich is the best celebration? Play video The next generation of the FA People's Cup? from BBC SportThe next generation of the FA People's Cup? Play video That's got to sting! from BBC SportThat's got to sting! Play video Ballers of the Caribbean are through to the semi-finals! from BBC SportBallers of the Caribbean are through to the semi-finals! I think that dancing is the perfect way for us to the end of the live text for today. A well done to all those who took part, regardless of whether you won or lost. The FA People's Cup is the best example of how football can be such an inclusive sport and bring people together. Join us from 10:00 GMT tomorrow, with the Adult Male Premiership, Championship, League and Youth Disability categories playing in the morning. In the afternoon, it's the turn of the Adult Male teams. We'll catch up on anything we may have missed this evening in Sunday's coverage. So, in the meantime, you can continue the conversation - letting us know how you've got on or are preparing for Sunday's action - with the #FAPeoplesCup hashtag on social media. And a reminder that there'll be a first-round highlights programme on the Red Button and online on Saturday, 2 March. Mr T saved the vital penalty in the semi final. The name Mr T is in loving memory of their friend Trevor who sadly passed away in July 2018. Check out these dance moves! Video caption: Ballers of the Caribbean are through to the semi-finals!Ballers of the Caribbean are through to the semi-finals! And over in Manchester, Rockerdale have won the Adult Female category with a 2-0 victory over FC United of Manchester. FC United went all the way and won the 2018 Adult Female trophy, but it's not to be this year. Chesterton Crusaders have beat Holmes Chapel Ramblers 6-2 in the Walking Football final to reach the next stage. It wasn't without its controversial moments as the ref orders a re-take on a penalty, but it's duly dispatched to give Crusaders victory. The FA People's Cup couldn't happen without you. We've been following the East London Little Ladies dads team throughout the day (see 15:42 and 16:26). They've just been beat 10-0 by GMV United but it doesn't matter, they're still celebrating anyway! 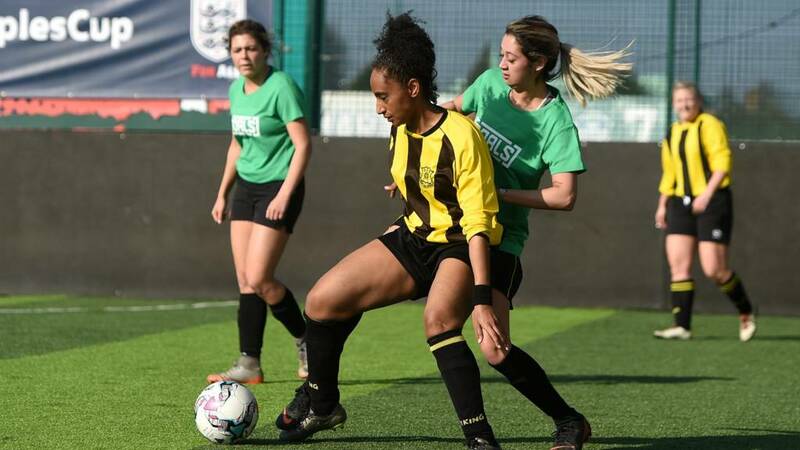 Well done to Aston University A in Birmingham, Crawley Old Girls in Tolworth and FC United Women who have all made it through to the semi-finals for their categories. If I was the Port Vale FC manager I’d be tearing my hair out. The defence stood ball watching as they think the initial shot is above head height. Referee confirms it was lower than six foot so play on. Holmes Chapel Ramblers take full advantage with plenty of time to find the net. There's plenty of support here in Sheffield! Time for the celebration of the day debate. Jav Heffern of Ballers Of The Caribbean getting warmed up for his semi-final with 10-year-old son Riley? Or the Pacemakers in Shoreditch? Think you’ve got a better one for us? Send it in using #FAPeoplesCup. Video caption: Which is the best celebration?Which is the best celebration? We saw earlier how excited Poppy and her mum were for even getting in the Women's Walking Football team for the FA People's Cup (see 10:33). Stoke v Port Vale clashes are always feisty and this one is no exception. Port Vale equalise with a well-placed finish after a short free-kick - how much space did Stoke want to give him though! Stoke City ensure they have a clear sight of goal by literally shoving the Port Vale defender out of the way. The goal was disallowed much to the Stoke man's dismay, but it didn’t affect the score as they went on to win 6-4. We told you earlier about the East London Little Ladies dad's team (see 15:42). The daughters convinced their dads to take part and take the training sessions too. Here they are enjoying their People's Cup experience in Shoreditch. Email Message: My name is Gareth Downing (60) and it was only three years ago a friend of my mine told me to come and play Walking Football with Brickfield Rangers, which are based in Wrexham. I had played local football until I was 47 and, after retiring, did (and still do) a lot of mountain walking to keep fit. I remember seeing an advert on TV when a gentleman went to his bank to get some financial help to fund his Walking Football team so jumped at the the chance to play for Brickfield as l used to help out coaching when my son James played for them. My name is Gareth Downing (60) and it was only three years ago a friend of my mine told me to come and play Walking Football with Brickfield Rangers, which are based in Wrexham. Only nine of us turned up for my first session but really enjoyed it - although finding it difficult not to run after the ball. Since then the club has grown in strength and we have a regular turn out of 24 players every Thursday evening. l, and some other Brickfield players, went for trials for the Wales Walking Football side, which had only just been formed and all got in the squad. Two months later l and two team-mates were selected to play in Wales’s first international game at Barry against England - who would have thought at 60 l’d be playing international football?! I’m so pleased l’m able to carry on playing the sport l love, apart from a fitness and health point of view, you meet some amazing people and characters. Our goalkeeper is a gentleman called Paul Davies from South Wales and when not playing he is the Reverend Paul Davies - nearly 70 years old! He keeps telling his team-mates we’ve got an extra man playing with us (the good Lord himself) - not sure what position he plays though! I’d recommend this Walking Football activity to everyone. Is that within the rules? Good luck in Chester guys! Congratulations Horsford F.C. Veterans and The Monument who have both made it through to the next stage. This keeper will take some beating! The Options Vets goalie comes to his attackers rescue. Fancy footwork leads to TNF being clean through on goal but look up "make yourself big" in the football dictionary and you’ll see a picture of this. Thank you to all the referees at all the locations across all of the first round games. Good to see you having some fun too.